“Rationally interpreting a work of abstract art or even just using verbal language to try and introduce someone to its perception can become an endless journey. The spectator, forced into a purely aesthetic, non-sensorial knowledge, risks floundering in informal magma, getting lost in swamps of misunderstanding and ambiguity. Understanding the creative mechanisms which lead to artistic conception, establishing how the artist has transformed intuition into pictorial material and reading the result is always difficult. 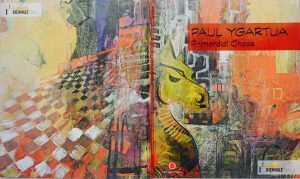 Paul Ygartua´s works are ideal for this kind of analysis, because we find images of an apparently transfigured reality, subtracted from every formal reference and, consequently, from a superficial and impenetrable reading. What attracts us is the exasperated chromatism, which invades the canvas until it dominates it completely. We are enraptured by the chaos of the colors that juxtapose thanks to quick brushstrokes or broader touches, created using a spatula. But while the spectator sees color as a catalyst, for Ygartua chromatics and the application of color encourage the flow of instinctive trends. The British artist’s compositions aren’t artistic translations of a solid world, but interpretations of the more impulsive, passionate and energetic part of the universe. Depending on how this energetic motion reaches the painter, reawakening his senses, it is changed into tonal orchestration, into a choir made up of numerous voices or into a concert with a reduced number of elements. The painter doesn’t record data, although he starts from a reality observed on several occasions and also reproduced in an objective way in the past; what he’s interested in now is the emotional strength transmitted by what is real. Nothing must conform to the real element from which it originated: the creative combination adheres exclusively to the moods aroused. The sensitivity with which Ygartua perceives things means that not only does he have the usual capacity to identify general structural properties, but also to discover their dynamic qualities: the artist succeeds in representing shapes through a game of strengths and energies that are released through reciprocal interactions, thus managing to reproduce the expressive value of objects. Ygartua’s art is a means of understanding the power of the vital movements of the world, a way of realizing its value and its power; his creations offer spectators the opportunity to comprehend the relationships that exist between the various elements that make up reality. Inside these visual statements, where the work is an authentic emotional thought and a tribute to the flow of vital energy, one also finds formal references, included largely for their metaphoric significance rather than for their objective value. The artist, having abandoned conventional organization and having chose to communicate in informal terms, also expresses the desire to return to the raw materials, to the primordial state of things. But the emotional chaos to which it refers can also represent the cosmic, psychological and artistic dimension, which precedes every creative deed. The painter translates this state of archaic upset on his canvases because he is aware that this condition acts as an original matrix: its strength generates creation. In this chaos, all the elements are joined before submitting to a single moderating force.